I have a confession to make. I do not play sport. No, let me come cleaner. I have never played sport except under duress. But somewhere in a mouldy album in my parents' house, there's a photo of me doing cricket, circa 1989. On a bone-dry pitch, I'm easing manfully into what could be the beginnings of a cover drive. In baggy trousers and a sweatshirt that could accommodate several 15-year-old runts like me, I don't quite look the part. In the next few seconds the tennis ball will flash past my waft and crash into the brick wicket, and I will make way for any one of my more athletic cousins. I'll scurry back to the perimeter of the picnic site, hoping I won't (a) drop the ball if it is whacked in my direction and (b) fall short with a girly, wayward throw. Both will happen. I only played cricket a handful of times, never with the sense that I was doing anything more momentous than playing marbles, seven-stone, dandibiyo or kabaddi. But frozen in Kodak time is a batsman on the move. How many such memories define us? I grew up in the expansive grounds of a boys' boarding school in the northern reaches of the Kathmandu Valley. You'd think cricket would feature prominently in a school set up by the Brits. But this was before 1983 ignited India's mania for cricket and, more important, before Nepal Television. Along with football and basketball and volleyball and other such commonplaces we played softball (baseball's overarm throws were deemed too hard) and crab-ball (klutzy indoors footy from a squatting position). A one-off rugby session for the seniors ended with blood streaming down someone's front. But no cricket. Forebears of the currently trending Nepal cricket team will tell you that they were playing through their childhoods, wherever and whenever they could. But locked into boarding school, dreaming of swallows and amazons, I never came across kids in gallis and on maidans. Probably I wasn't looking. Until 1996, and the World Cup final between Sri Lanka and Australia. I was an undergrad in the land down under, rooting for an underdog I knew practically nothing about. We were seduced by the effervescence of the Lankans, and turned off by the all-conquering, arrogant Aussies. Cricket seemed exciting and smart, but Nepal didn't really have a national team back then. Our Under-15, U-17 and U-19 teams began to dominate the ranks of the Associate teams in the first years of the millennium, but Team Nepal wasn't playing anywhere I knew about, and they most certainly weren't on TV. Our sporting potential grew up and went to America to wash dishes and party hard. Instead, we had the Indians. Even as we resented the interfering, bungling politics of our giant neighbour, we couldn't help but suckle at the cultural jagannath that was India. We danced to Bollywood. We cheered for Team India. Over the last decade I watched the Indians as they bumbled from one overseas defeat to another, regrouping to thrash hapless tourists back home. A victory was somewhat satisfying, but defeat provoked only contempt and vows never to watch them again. Until the next time. There was no emotional investment. Sachin, Sehwag and Dravid belonged to 1.2 billion others. Then our national team began winning. Buoyed by Nepal's qualification for the World T20 in 2014 (and undeterred by our subsequent ejection) I wrote an exuberant paean titled "Here's to losing!" I wanted Nepal to be the next Bangladesh, the whipping boys of world cricket. Other Nepalis demanded more of their shiny new cricket team. If they could have, they'd have voted in handsome, outspoken captain Paras Khadka in place of the king their politicians had just voted out. If they could have, they'd have replaced the politicians themselves, paralysed by Nepal's impending federalism, with their multi-ethnic, multilingual cricket team. Here was the vaunted Nepali harmony in action, working for a future we could all envision - holding our heads high on the world stage, blasting sixes off the last ball. To paraphrase the Italian philosopher Umberto Eco, sport was a substitute for politics, and life itself. Dear Cricket Monthly, by the time this gets to you, the World Cup will be picked clean, and I will be rueing the hours spent deciphering the Morse code of dots and 4s and 6s and Ws. As I say, I don't play. I've never experienced the exhilaration of hitting the ball out of the park, or taking a catch. As a solitary writer I am wary of the sweaty camaraderie of the lowest common denominator. Even as my ageing peers heave themselves about the AstroTurf, caught in Kathmandu's craze for futsal, I keep to my treadmill. My love for cricket sits uncomfortably with flag-waving; I like to think it draws on a nostalgia for simpler, richer times untainted by filthy lucre and neon noise, and a conviction that at least in its five-day avatar, it's a notch above other sports. It has multiple narratives, it has character development, it demands patience, it's not unlike reading. The shorter forms have their place; still they are but item numbers on the maidan. They make for guilty, hollow pleasures. It's dusk in the Kathmandu Valley as I finish this ramble. On this exceptionally clear spring day, the Himalayas loom massively above the concrete miasma of the Nepali capital. All around Tundikhel, the dusty parade ground in the heart of the city, young boys and men are wrapping up their makeshift games of cricket and returning to their mothers and wives and dal bhat tarkari. 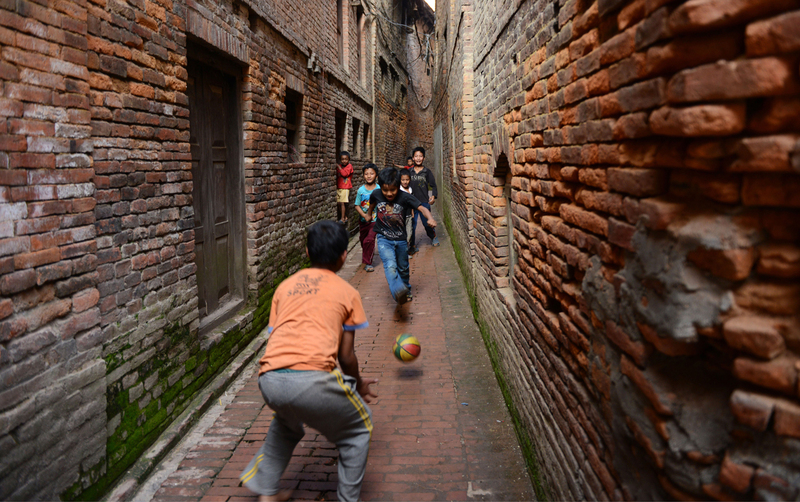 Some of these amateurs dream of sporting glory in the whirligig of New Nepal, dreams beyond the grasp of yesteryear's straitjackets. As we pack our gear into bags and haul our bodies onto buses, micros, tempos and bikes crawling through the sprawl of our present, the mountains remind us how far we have come, and compel us to consider if the past half-century of development and destruction has been worth the journey. But we are already here; there is no going back. On 25 April, a 7.9 magnitude earthquake killed over 6000 in Nepal and, almost overnight, the open space of Tundikhel was transformed into a giant refugee camp. This letter was written before the disaster consumed the country.